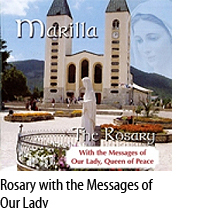 This Rosary CD incorporates the messages, particularly regarding the Rosary, given to the children by Our Lady, in Medugorje. All of the messages chosen by Marilla relate in a special way to each mystery on this beautiful Double CD. The special atmosphere surrounding Medugorje has been captured by Marilla and as we pray we’re led gently into a closer relationship with Our Lady.